Now we are properly into summer, but we had some lovely early summer spells with plenty of sunshine and some good “growing” rain! It’s been a good year for all the blossom and flowers, and the fruit looks to be setting well, though maybe not as heavily as last year. By the time you read this, you will see the young apples and pears, damsons and plums, and the cherry plums will be ripe. Wild cherries may have come and gone – you have to pick them quickly once they’re ripe or the blackbirds will get them! The Celtic tree for July is the holly, which seems odd to us because we associate it so much with December. It wasn’t a plant particularly associated with the old midwinter festival, only the later Christian one. It had certainly been associated with Christmas since the middle ages. Holly doesn’t even flower in July, but much earlier in the year, in May. The flowers are pretty, small and white in clusters at the base of the leaves – easily missed. In really mild winters they sometimes blossom in winter, as they did a couple of years ago. The blossoms attract a special butterfly, the holly blue. In the autumn this appears again to lay a second brood, and this time it feeds on ivy. Unfortunately, a lot of holly hedges are cut hard back so they don’t flower or have berries. But if they flower well, and they did this year, we should get good berries in the winter. Holly has male and female flowers separately; sometimes on different trees, though, so you need a female flower to bear the berries and a male to fertilise. The berries are loved by birds, who will strip them in a cold winter. Despite the female having the red berries, holly is treated in folklore as a very male tree, a bit like the oak. And like the oak, it is sometimes called the king of the woods (“Of all the trees that grow in the wood/ The holly tree bears the crown”). This is mostly because of its association with heroes and gods in folklore, the hero that overcomes the darker forces of the ivy, or the female power of the ivy in some legends. Many traditions have a battle in winter between the forces of fire and light, symbolised by holly, and the forces of darkness. You get it in stories about the fight between the robin and wren too, and it persists in the mummers’ plays where St George with his red cross defeats the powers of darkness. So, holly is a kind of burning bush of blood, light and life. In more prosaic real life, holly was encouraged to grow and prized as a fodder crop. This seems strange, as the lower leaves of holly bushes are so prickly animals can’t eat them – that’s the point of the prickles! But if you look further up the tree, the leaves are free of prickles and relatively soft, above the reach of grazing animals. With a little help from people, the higher branches were picked and fed to animals during the winter when grass was scarce. It is one of only a few native evergreens, and the only edible one for animals, so you can see how valuable it must have been in winter. 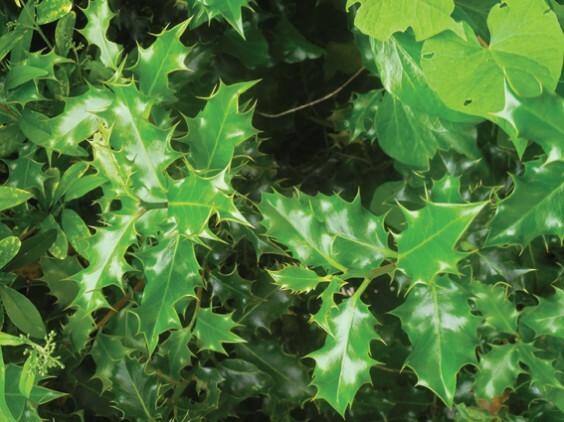 Holly grows to quite a big bush in the open, and clumps of holly were often called Hollins, a word that survives in place names and people’s names (The Hollins, Hollingsworth and so on). There are Holly Cottages and Hollybush Roads round here – and of course Hollywood. Sometimes the trees were used as boundary markers, like the oak. And there are pubs named after the holly bush. It also grows profusely as an understory in woods, where it is sometimes seen as a nuisance, but it is a good protective tree which doesn’t need much sunlight to grow. Holly of course is THE Christmas plant and was brought into churches even in medieval times, leading to its being sometimes called the holy bush or just “Christmas”. The kingly nature of red berries became associated with Christ, and the leaves with the crown of thorns. There is a funny old tradition about bringing holly in for Christmas. If the smooth leaves come in first, then the wife rules the household: if the prickly ones come in first it is the husband! Holly wood is small and hard – an interesting traditional use was for wooden handles for teapots, and it was also used for riding crops. The story that a profuse crop of berries on holly means a hard winter to come is not true. The berry crop depends on the flowers that year, the weather and the size of the previous year’s crop! My second tree this month is the field maple. It isn’t one of the Celtic calendar trees, but is common around here, if unrecognised. It doesn’t grow much in the Celtic countries. It’s our native member of the Acer family, along with sycamore which was introduced but is now naturalised. Many people know the foreign, especially Japanese, Acers which are a feature of ornamental gardens, especially for autumn colour. Our own field maple is a very pretty tree too. Like all maples, it has five-pointed leaves, in this case small and rounded. They are lovely when in light spring green, and in the autumn go a gorgeous bright yellow. The tree is common in hedges along roads and the canal. It’s relatively small and doesn’t seem to grow to a great age. The leaves and wood are full of sugars and the leaves used to be stripped for cattle feed, like the holly. You could get maple syrup from the tree, though the maple used in the US and Canada for this is slightly different. The wood is too small for most uses but is beautifully marked and stripy, so is much in demand for ornaments. The spring flowers are very pretty, in little upward growing clusters, and have male and female parts on the same flower. In the autumn, like many trees, they have “keys” or winged seeds. Related trees include the sycamore, a rather maligned tree as it grows everywhere and isn’t especially pretty. But is has been very useful in growing where other trees can’t, even in cold and salt sea-winds, and is much planted as a shelter belt around houses in bleak areas. The flowers are very pretty, dangling masses of tiny golden florets, full of nectar and buzzing with early bees. The leaves are lovely when they first appear too, often reddish and coming quite early in spring. Another tree that looks similar with five-pointed leaves, but isn’t related, is the plane. This is the favourite city street tree, because it absorbs pollution and seems to thrive on it! There was one outside my window when I worked in Handsworth, lovely in spring when the first leaves came out and comical in autumn with its odd balls of seeds. Trees have so many uses! My poem this month is about a recent very Alvechurch event. Outside the resurrected Crown, warming with talk. Burning among them with the flames of love. Warm enough to move your bones to laughter. A red spirit, of passion and blood, unquenchable life. As we sing and dance to keep the sun alive.